Unlike gas or charcoal, wood pellets come in a much wider variety of brands, blends, and flavors. The possibilities for making deliciously smoked meats are endless. So how are you supposed to know what the best wood pellets for smoking are? 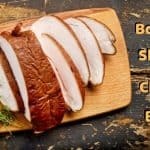 We have taken a look at what is burning in the hoppers of some of the best-known names in barbeque and determined five brands that you are going to want to familiarize yourself with. 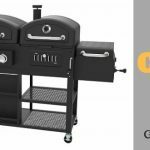 Get your pellet smokers ready – Need a pellet smoker? 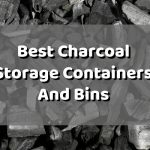 Check out our list of some of the best! We guarantee you will want to try them all! Our mouths water just imagining the endless possibilities with BBQrs Delight Wood Smoking Pellets. Many experienced smokers will tell you that BBQrs Delight is the only brand of smoking pellets they use. That’s because BBQrs Delight offers one of the largest selections of flavors available on the market. Their flavors include some of the standard favorites, such as Apple, Mesquite, and Hickory. 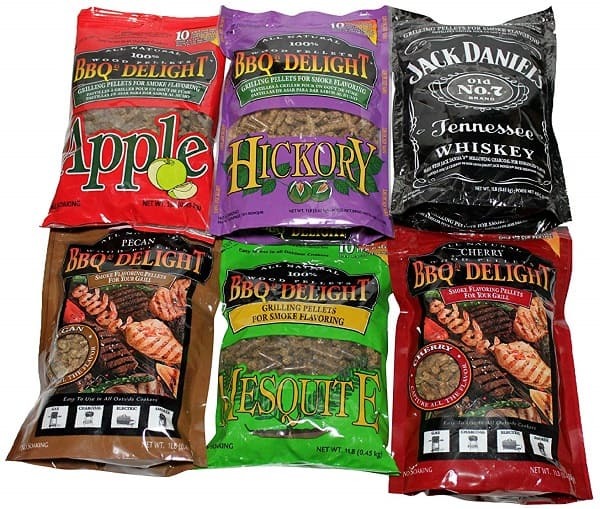 But BBQrs Delight also offers some adventurous flavors such as Jack Daniels. These pellets originate from oak wood and whiskey-soaked charcoal straight from the Jack Daniels distillery. You can use each flavor individually or make your own blends. Will you try Apple and Jack Daniels? Cherry and Pecan? Or maybe even Hickory and Mesquite? We have found that when it comes to BBQrs Delight, there is no wrong combination. BBQrs Delight uses 100% natural hardwoods with no added chemicals or artificial flavors. This variety pack with the six most popular flavors is a great way to experiment with different flavor profiles. For most uses, only about 1/3 cup of pellets is necessary, meaning you can get about 60 uses from this variety pack when used as directed. Regarded as one of the best, Lumber Jack Smoking Wood Pellets is a brand that gets right down to business. They don’t waste time with gimmicks. Lumber Jack focuses on providing high-quality pellets for your smoker in a multitude of pure or blended flavors. These pellets are smaller than some other competitors, so they tend to burn hotter with more smoke and more surface area. They have a clean, smoky flavor with very minimal ash build up. Lumber Jack Smoking Wood Pellets may cost more than other brands, but when it comes to their quality, you get what you pay for. That’s why these pellets are some of the most trusted in the world of professional smoking. Use these pellets for all types of meats and vegetables, and even pizza if you are feeling in the mood for something different (and delicious!). Lumber Jack carries many of the standard flavors, such as apple, oak, and cherry. They also produce high quality blended flavors. We particularly enjoy the maple, hickory, and cherry blend, which pairs exceptionally well with pork or chicken. 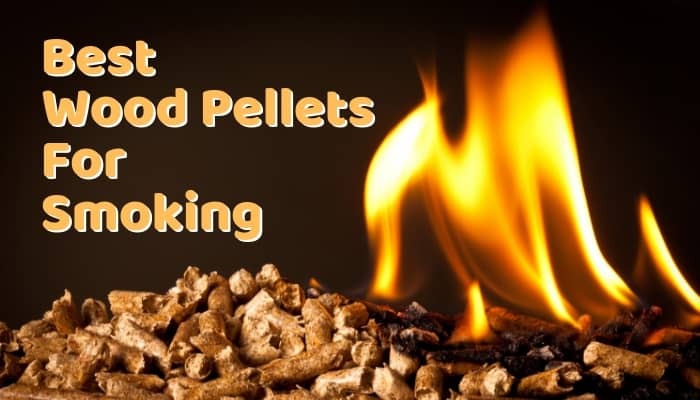 Another best selling brand is CookinPellets Smoking Pellets. Although more limited in flavors, CookinPellets has long been a consumer favorite thanks to its high quality. The pellets originate from 100% hardwoods and include no oak or alder fillers. 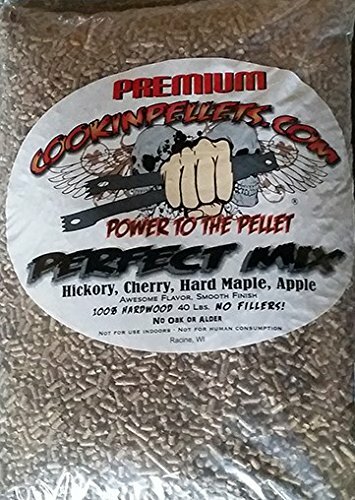 CookinPellets are perhaps best known for their “Perfect Mix”. The special blend is made from the top four hardwoods – a Hickory base with Cherry, Hard Maple, and Apple. This creates a really complex and dynamic flavor that isn’t overpowered by any of the individual flavors. The pellets do not contain any bark, as they are made from heartwoods in the center of the logs. Bark in pellets can increase the amount of ash and heat. CookinPellets are perfect for long smokes like brisket or pulled pork. The moisture content is very low, and the pellets keep a stable burn regardless of temperature. They are cost effective and work in most all pellet smokers. Barbecue lovers have found it hard to argue that there’s a more perfect mix than this. You probably recognize the name Traeger from their well-known grills and smokers. So it is no wonder that they also have created a Signature Smoking Pellets Blend. This blend is a flavorful mix of sweet Maple, tart Cherry, and savory Hickory woods. They are 100% all natural hardwood pellets. 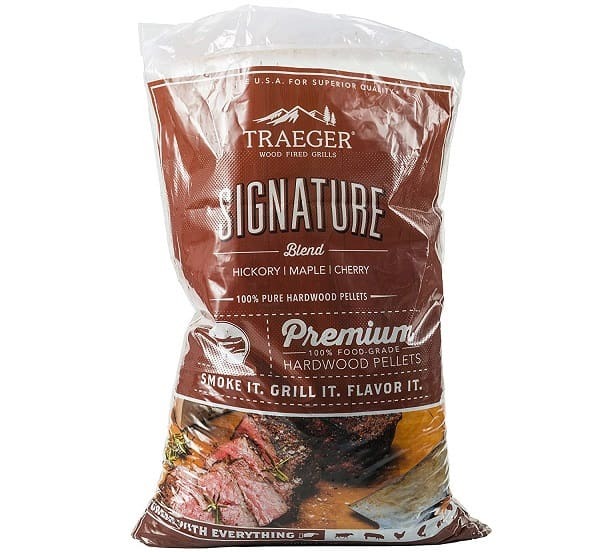 Traeger also has an assortment of individual flavors, such as Hickory and Mesquite. It is worth noting that Traeger pellets tend to burn hotter and longer, making them ideal for long smoking sessions. They also have some of the more adventurous blended flavors on the market, including a Winemaker’s Blend, Big Game Blend, and a blend inspired by Leinenkugel’s Summer Shandy. Traeger pellets are ideal for enthusiasts who are just beginning to experiment with pellet smoking. The price ensures they are affordable and economical. They are also sustainably sourced and manufactured within the USA. 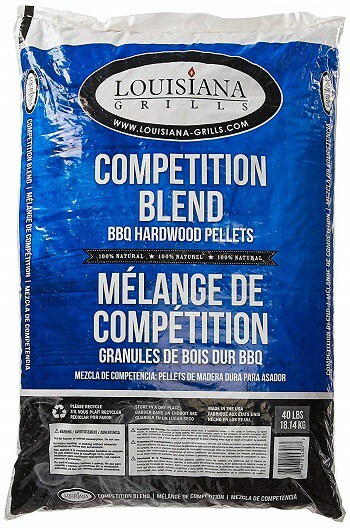 Another grill company with its own brand of pellets comes from Louisiana Grills and their Competition Blend Pellets. The competition blend is a very versatile mix of sweet, savory, and tart flavors. It includes 50% maple, 25% hickory, and 25% cherry woods. These pellets are all natural and sourced from across North America. They do not include any artificial flavors, oils, or sprays. They also come in a variety of other flavors, including Tennessee Whiskey Barrel, New England Apple, and Georgia Pecan. Cleanup is easy and convenient, as these pellets produce very little ash. 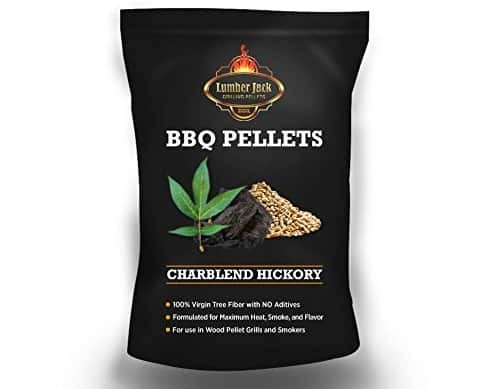 Whether you are cooking fish, pork, beef, or poultry, the flavors produced by smoking these pellets is rich and penetrates the meat very well. The competition blend is the best of all worlds and is definitely worth trying. Wood pellets are a type of pellet fuel made from compacted wood. Just like any other fuel source, there is a wide range of brands and prices. But there are also a wide variety of different flavors. In early American history, pellets were simply a byproduct of lumber mills. Their primary use was as a source of heat in wood stoves. Flash forward to today and pellets have become more refined and versatile. Used in pellet smokers, wood pellets produce a distinctive, smoky flavor without the cleanup mess of some other fuel sources. Pellets are convenient to use and often described in terms of “set it and forget it” because they require less attention while cooking than other fuel sources. Most of our favorites do not contain additives or fillers, meaning they burn clean with very little ash produced. Another benefit to using pellets is their versatility in flavors. You can find wood pellets in both hardwood and fruitwood varieties, as well as premade blends. If you don’t like the idea of someone else deciding the proportions of a blend, you can make your own flavor combinations. Smoking with wood pellets can be an exciting way to try new flavors in your smoking. Using high-quality wood is essential to getting the natural flavor to shine through in hardwood smoker pellets. Hardwood pellets have a very woodsy, natural flavor reminiscent of the trees used to produce them. On the milder end of the spectrum are Oak and Alder. Some brands use these two kinds of wood as fillers because their flavor isn’t as strong as other hardwoods. This imparts an earthy flavor that doesn’t overpower the meat and can mellow more overpowering flavors of pellets. They are also great on their own if you like a more subtle smoky flavor. The most popular hardwood varieties of smoker pellets include Hickory, Maple, Pecan, and Mesquite. All of these have very unique, powerful flavors and taste great individually. You can also blend different flavors of hardwood pellets together for more complex flavors, or you could also add some fruitwood pellets. Fruitwood pellets are great for adding some sweetness and tartness to what may otherwise be a savory one-note meal. They are perfectly good on their own, but they also add new levels of flavor to blends. The smoke taste is slightly stronger in fruitwood smoker pellets. The most commonly used fruitwood smoker pellets are Apple and Cherry. Both provide a balanced level of sweetness and tartness. They are especially tasty when used with poultry and pork. Due to their composition, wood pellets break down easily if they get wet and rarely are salvageable. For this reason, you should store your wood pellets in a cool, dry location. Keep them in a container that is waterproof and airtight. You should also try to keep them out of direct sunlight. Do not allow unused pellets to sit on the ground or anywhere where they may absorb moisture. What are the best wood pellets for smoking? There are so many good brands and varieties to choose from that it is impossible to narrow it down to just one. Our five most trusted brands are all winners in our book. Once you have tried them, let us know if you have a standout favorite. Don’t forget to experiment with your own blends of flavors. The options are limitless!